Very briefly, these are the events which shaped Tartu into the city it is today. In 3000 BC Finno-Ugric tribes arrive from the east, mixing with Neolithic tribes that had been in the area since the Ice Age. The first mention of Estonia comes in the 1st Century AD when Roman historian Tacitus writes of a people called Aestii. Around 600 AD, Estonians build a wooden fortress on the east side of Toome Hill. This settlement, Tarbatu, develops into a strategic trade link between Scandinavia and Russia. With the aid of the future Viking king of Norway, King Harald III, alongside some of his former Varangian guardsmen, Kievian prince Jaroslav the Wise conquers Tarbatu in 1030, renaming it Yuryev. The Russians remain in control until the Estonians manage to drive them out in 1061. In 1202, the Pope calls for a crusade against the pagans around the Baltic Sea. Taking up his call, the German Order of the Knights of the Sword begins conquering and Christianising Estonia. Tartu, the last Estonian holdout, falls in 1224. As a result, Tartu is made a bishopric, part of the Riga-based Livonian state. Meanwhile ethnic Estonians are reduced the status of serfs. In 1262, Prince Dmitry of Novgorod attacks and destroys Tartu, but fails to capture the Germans’ new stone fortress on Toome Hill. During this century Tartu develops into a busy merchant town. Dorpat, as its mainly German residents call it, joins the Hanseatic League in the 1280s. Ivan the Terrible begins attacking Estonia, touching off the Livonian War (1558 - 1583). Tartu surrenders to the Russians at the start of the conflict, but soon Denmark, Poland and Sweden enter the fray, each battling for control of the collapsed Livonian state. A peace treaty in 1582 cedes Tartu to the Polish-Lithuanian empire. The Polish king gives Tartu the distinctive red-and-white flag, which it still uses today, in 1583. Sweden is still battling Poland for possession of southern Estonia at the start of the century and finally gains control in 1625. The Swedish period of rule in Estonia is marked by cultural advancement and a relatively enlightened view on treatment of Estonian peasants. In 1632, King Gustavus Adolphus II founds Academia Gustaviana, now known as Tartu University. The Northern War breaks out in 1700, with Russia attempting to capture the Baltic territories from Sweden. Peter the Great leads an attack on Tartu in 1704, and in 1708, afraid the Swedes would retake it, gives the order to blow up the town. 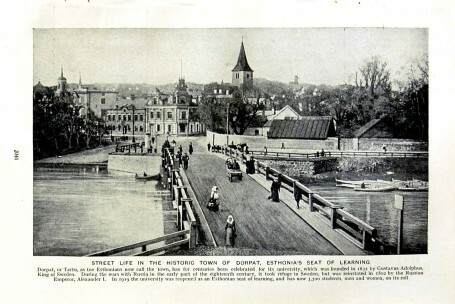 Tartu’s German citizens, 824 in all, are imprisoned and taken to Russia. In 1710, the university closes, and by the war’s end in 1721, the population stands at just 21. Fires ravage the town, with the worst, in 1775, obliterating the last remnants of the medieval city. Things turn around, however, the end of the century when the town undergoes a period of rebuilding and revival. 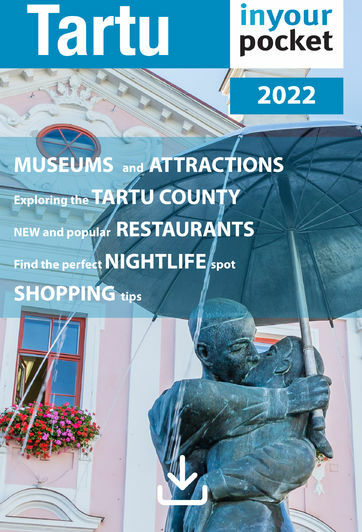 Tartu University reopens in 1802, paving way for the city’s development into the ‘Athens on the Emajőgi’, an intellectual centre that feeds the growing awareness of ethnic Estonian culture. During the National Awakening period in the second half of the century, Estonians begin an active period of scholarship and literary creation. The first Estonian Song Festival is held in Tartu in 1869, and in 1870 Estonia’s first national theatre, the Vanemuine, is established here. Taking advantage of the chaos in Russia caused by the WWI and the Bolshevik Revolution, Estonia declares independence on February 24, 1918. But by the end of February, Germany takes the infant country by force. When Germany capitulates in November, Bolshevik forces move in. The War for Independence lasts 13 months. On February 02, 1920, the Soviets sign the Tartu Peace Treaty, renouncing claims to Estonian territory “for all time”. After an economically shaky start, the new republic develops quickly, with social welfare laws on par with those of Western Europe. A political crisis in the 1930s brings the country to the verge of authoritarianism, but president Konstantin Päts maintains popular support. On August 23, 1939, the USSR and Germany sign the Molotov-Ribbentrop pact, secretly ceding the Baltics to the Soviet sphere of influence. Soviet forces move in to occupy in June 1940, and in sham elections, establish a puppet parliament that votes to join the USSR. In 1941, Germany pushes out the red forces, beginning a three-year occupation. In 1944, bombing by Soviet forces destroys much of downtown Tartu. By September, the Soviets regain control, and arrests and deportations soon follow. Estonia endures political repression and isolation, while Estonians who fled to the West try to keep their culture alive in exile. In Tartu, hopes for independence never completely die, however. In 1977, the Estonian flag is raised illegally over the Vanemuine Theatre to mark the 59th anniversary of the republic. A new National Awakening, centred in Tartu, begins in 1987, eventually leading to mass protests and calls for independence throughout Estonia. On August 20, 1991, immediately after a failed Soviet coup, Estonia declares its independence from the USSR. Tartu quickly dusts off the Soviet grey and once again takes up its role as the intellectual capital of the nation. Commercial development and links with international institutions pick up the pace and by today, the 'City of Good Thoughts' has become a thriving EU city.